Virginia’s kids are spoiled with riches. 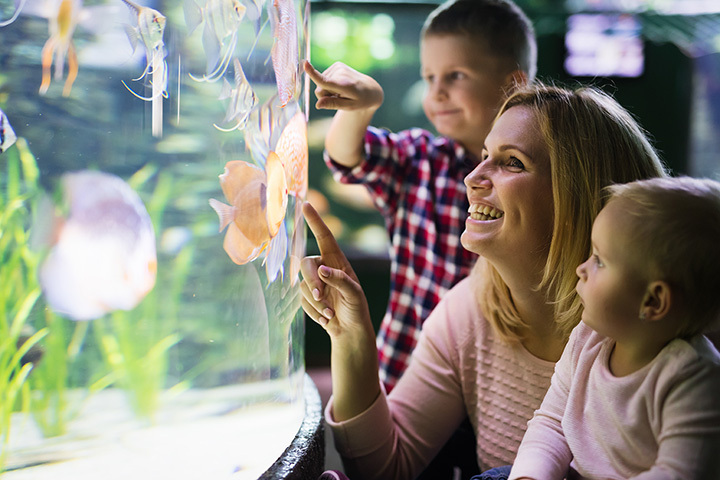 Between water parks, zoos, aquariums, and incredible natural treasures, Virginia offers some of the most robust family-friendly attractions in the nation. Check out these 14 options to make any outing a memorable one. Stop by the Greater Pohick Bay in Woodbridge, Virginia, for a day of water activities on the Potomac River. Rent kayaks, paddleboards, kayaks, or water tubes and careen down the 1,000 acres. Go for an afternoon hike and round out the evening with a picnic as the sun goes down. The Great Wolf Lodge in Williamsburg, Virginia is known as the largest indoor water park in the country. Stay on the premises for a weekend of water fun. Kids can stop by the Howlers Peak Ropes Course, MagiQuest game, and Howly Wood XD Theater to add a little extra value to the trip. Stop by Weirwood, Virginia for the Eastern Shore Hang Gliding Center. No experience is necessary to soar through the sky. Ages four and up are welcome, and no experience is necessary. If you’ve ever wanted to get your Superman on, this is the place to do it. The Adventure Park at Sandy River Retreat in Farmville, Virginia offers over 70 obstacles and 20 rope lines for visitors of all ages. Stay on-site in one of the traditional log cabins to make the most out of your trip. Canoe and bicycle rentals are offered on site, too. Southeast Expeditions in Cape Charles, Virginia, offers guided tours of the cape. “Recognized by The New York Times, the Washington Post, Virginia Living, Southern Living, Coastal Living and dozens of other publications for providing unparalleled experiences like the World’s First Kayak Winery Tour at Chatham Vineyards, and our Kayak Clamming Expedition.” A great way to discover Cape Charles for the first time or discover it again. The National Air and Space Museum in Chantilly, Virginia, has two hangars displaying thousands of aircrafts. Younger visitors in particular may enjoy seeing the Space Shuttle “Discovery,” but with so many aircrafts to see, few leave disappointed. Take a tour or peruse by with your family. Either way, you’ll be mystified by the miracle of flight. Want to ski year-round? Look no further than the Snowflex Center in Lynchburg, Virginia. The Snowflex Center is part of Liberty University and is located on Liberty Mountain. This is the only year-round synthetic ski slope center in the United States. Enjoy the skiing, snowboarding, or tubing any time. The Virginia Aquarium and Marine Science Center in Virginia Beach, Virginia, has over 300 exhibits. Stop by the National Geographic 3D Theater or the IMAX Theater for films relating to science, or even to see the latest Hollywood blockbuster. The sea exhibits offer a view of nature unlike any other available in Virginia. The Center is growing all the time, adding new animals and things to do, so make sure to check out the website for the latest updates. Ever wanted to experience life as a Civil War soldier? Now you can, at the Pamplin Historical Park in Petersburg, Virginia. While some kids might not relish the idea of leaving their iPhone behind, most families will find that a weekend without modern luxuries brings them closer together. If you’re interested in a unique experience, give Pamplin a try. While you’re in Petersburg, stop by the Virginia Motorsports Park for an afternoon of off-roading mayhem. Rent a bike and hit the trails, or watch form a safe distance. The park also offers camping options for those less inclined to get behind two-wheels. Portsmouth, Virginia, houses the Virginia Sports Hall of Fame and Museum. Known as “an interactive family attraction,” the Hall of Fame tells the stories of Virginia’s sports legends and keeps many artifacts safe. Attractions include a Washington Redskins Skybox Experience, “You Make the Call” Media Center, sports complex, golf exhibit, and the hall of fame itself, among others. The Luray Zoo in Luray, Virginia, hosts one of the largest exhibits of reptiles on the east coast. With over 250 other animals, the zoo has attractions for all ages. While there, stop by one of the classes to learn about proper pet care and the importance of conservation. Don’t forget the petting zoo on your way out. What’s a visit to Virginia Beach without a pirate adventure? Captain Jack’s is an oceanfront pirate-themed cruise in which participants take on the role of a pirate setting sail to search for stolen treasure. Younger kids will love the face painting, pirate lesson, singing, dancing, and themed games. Adults will love the full-service bar on board. What’s a visit to Virginia without stopping by the first American settlement in North America? The Jamestown Settlement in Williamsburg, Virginia is a replica of the original settlement from 1607. Younger children will enjoy seeing how life once was and taking part in the many educational programs offered on site.